What better time to talk about the art of the US mint than 4th of July weekend?! It may be cliche at this point but I still love the look of a handful of vintage stamps plastering an envelope or postcard in lieu of a shiny new stamp (the new Love stamp might be the except to this sentiment). You may ask, "can you actually use vintage stamps?" The answer is YES, as long as they are not already canceled. The value is the same as what is printed on the stamp. Be prepared to spend a little more on postage. Vintage comes with a price, and that price is called "Catalog Value." Just remember that your stamp selection becomes a major component to your design. If you love the look of vintage stamps, just think of the extra expense as design-related, not mailing related. This may seem obvious, but the value of the stamp as you are putting it through the USPS system is the same as the value printed on the stamp. They don't care that you may have paid more than face value. Be prepared to remain flexible. You'll need to mix and match stamps and your selections will all depend on what is available at any given moment. 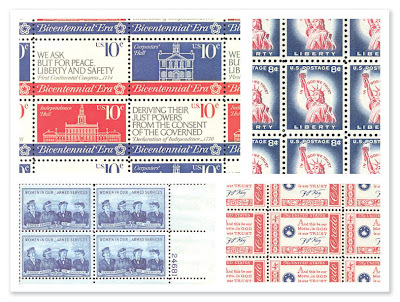 It is quite possible to put together a collection of stamps that fit a color theme and/or topic theme. The fun is finding the best mix! If you become a serious stamper, you'll want to order the latest Postal Service Guide to US Stamps so you can see full size images of the stamps and reference their catalog numbers when working with stamp dealers. Happy hunting! I feel a new (admittedly dorky) obsession coming on! You reminded me of my age old hobby of stamp collection.Though i left it quite a while ago as i got busy in my business but you tried to rekindle that love and thanks for providing me a resource to visit i.e stamp shows worldwide website. We're back... and tweeting, too!